If you want a simple gift/craft for the holidays, it does not get much easier than cinnamon ornaments. All you need are cinnamon, applesauce, a rolling pin and cookie cutters. There is no cooking involved, or special equipment. You combine the cinnamon and applesauce to make a sort of dough. You roll out the dough and cut it into shapes. Then, you just need to let the ornaments dry and harden. Allow a few days for drying. If you put them in a dehydrator, they are dry in a few hours. The house smells really good while they are drying. Even after they are dried, they continue to have that wonderful cinnamon fragrance. 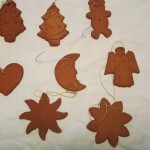 They can be used as ornaments on a tree or simply hung to freshen a room. This is a fun gift for kids to make, too. Here are the directions. These are for decorating, not for eating! Mix applesauce and cinnamon and knead to form a stiff dough. 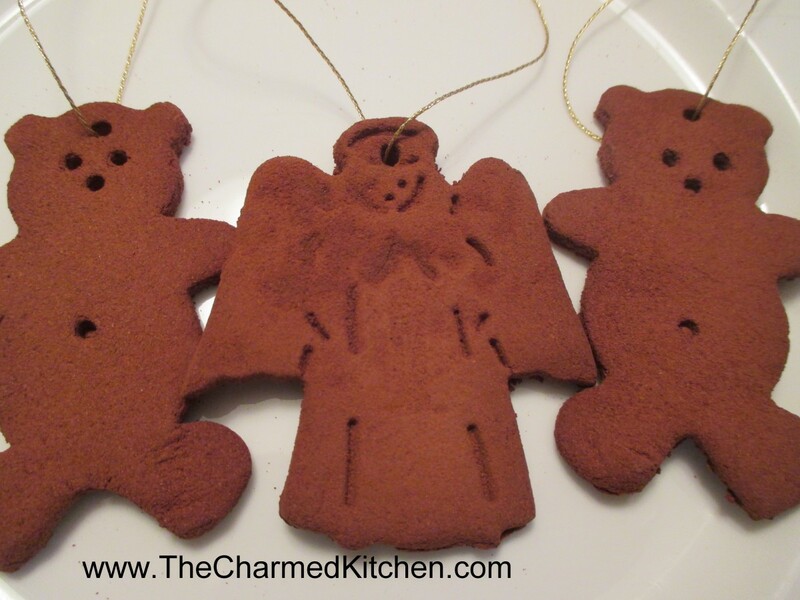 Roll out to 1/4-inch thickness and cut out with cookie cutters. Make hole in top of ornament with skewer or straw and carefully transfer to rack to dry. Let dry a couple of days, turning occasionally. 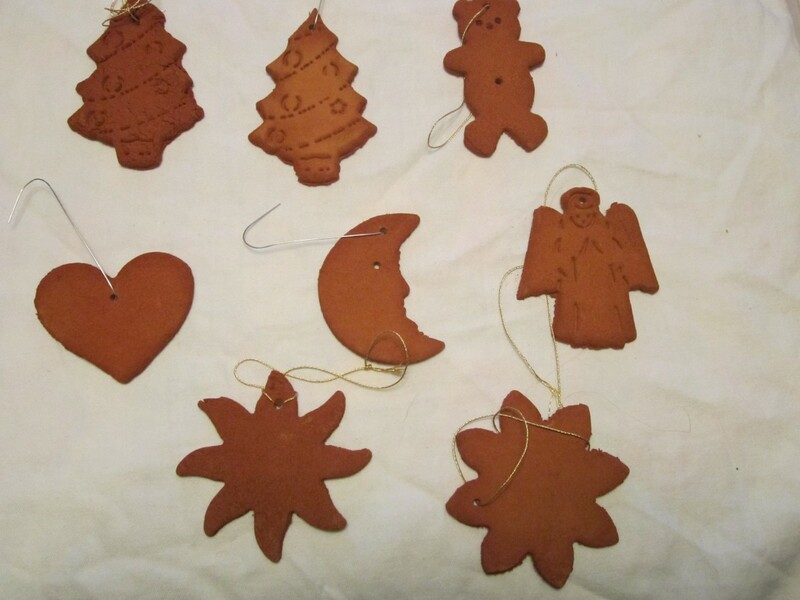 Hang dried ornaments with decorative thread or ribbon. Makes about 12-15. I have some really fun childhood holiday memories. 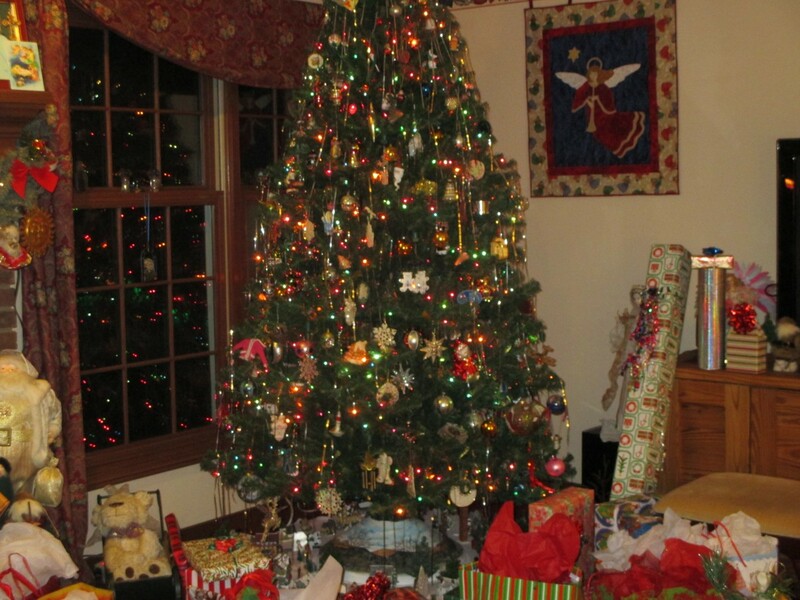 Perhaps the most fun was getting our own Christmas tree. What really made the trip fun was going with Uncle Frank. Uncle Frank was my dad’s baby brother. He was always so much fun. He had a great sense of humor, too. The one thing Uncle Frank never seemed to have- at least at tree cutting time- was a car with a working heater. I am not sure if he and my dad thought it was more of an adventure that way. I mean, we could have gone in my family’s car- but we never did. One year in particular, will always stand out for me. There were 7 of us in a Volkswagen beetle. Two adults, my Dad and Uncle Frank, three of my cousins, my brother and me. Of course, no heater in the car. It was also a very snowy December, so the car was cold. We were all bundled up as we headed out to get a couple of Christmas trees. There is a small space behind the back seat in an old Beetle. That is where my cousin Laurie and I sat. My brother and two cousins shared the back seat. Dad and Uncle Frank sat in front. When we got to the tree farm, the dads pretty much left us kids on our own. There was a lot of snow on the ground and I remember sliding down a snowy hill, over and over. When we were called back to the car- we were all pretty cold- and our boots were full of snow. I don’t want you to think that my Dad and Uncle Frank were not good parents or reckless. They were the best- and so much fun. They insisted we all take off out wet boots when we got in the car. Everyone tossed them in the area in back were Laurie and I had been sitting. We joined the others in the back seat. My cousin Gary sat on my Dad’s lap. Well, that was after my Dad and Uncle Frank got in the car. See, there was this problem with the trees. For some reason they didn’t have enough rope- or any rope. I don’t really remember that part. I just know, that at some point, with the kids shivering in the car- we were now wet and had removed our boots- My Uncle Frank and my father started taping two pine trees to a VW Bug. I remember them passing the tape over and under the car, making sure the trees were not going anywhere. I feel the need to point out, that the rounded top of the beetle was not an easy place to secure a tree- or two. So the trees ended up more on the sides of the car, taped securely into place. I learned at a very early age, the value of duct tape. The guys had to come in through open windows, since the trees were pretty much blocking the doors. When my Uncle started up the car- the windows were all frosted up. The heater did not work, so no defroster for the windows. He used his thumbnail to scratch off an area of ice about the size of a silver dollar. He closed one eye, put the open eye up to the little circle he had cleared on the windshield and declared – it was fine- he could see just fine. We all laughed. He was laughing, so was my Dad. We took our cues from the adults and joined in the merriment. It was a cold, but laughter- filled ride home. When we got back, my uncle crawled out the window and un-taped the trees so we could all get out of the car. My Mom and Aunt quickly got us into dry clothes and I am guessing they were not as amused by our condition as we were. The point is, no one got hurt and it probably toughened us up a little. I am glad there are car seats and seat belts and air bags in cars today. I think kids and adults should be safely secured in all moving vehicles. But way back when- we didn’t have those safety features. It isn’t like they decided not to strap us in- they couldn’t. While my Uncle Frank was laughing and joking around that day, he was also a police officer. I am sure he knew how to drive in snowy conditions. Maybe he was nervous. Maybe my dad was, too. But if they were, they didn’t show it. I know there was a lot of love and laughter in the Beetle that day. I can only imagine the looks we got from other drivers on our way home. I couldn’t actually see other cars, however, as the view was blocked by the tree branches and frosty windows. If there is any lesson- perhaps it is to be brave enough to be silly sometimes. While I don’t want anyone to put a child in harm’s way- don’t be so careful that your kid’s miss out on adventures, too. Be the person that gives a kid a really good memory this holiday season. Perhaps, using duct tape and a couple of trees. I posted this story last year and had a request to post it again….so here it is…. Rather than posting a recipe today, I wanted to share a fun Thanksgiving memory with you. Through most of my younger life, Thanksgiving was spent with my family and my Aunt Tillie and Uncle Art’s family. My mother and my Aunt Tillie were sisters. They were as close and loving as sisters could be. We took turns at each others homes, and shared the cooking duties. There was a friendly rivalry every year to come up with a special dessert or to have a new side dish. The biggest part of this challenge though, was to get a really big turkey. My mother was convinced that a big bird was tastier than two small ones. Aunt Tillie agreed. So every year it was the quest of the host family to score a really large turkey. My mom and dad would go to the local butcher to order the bird weeks in advance. I am sure Tillie and Art did the same. They always seemed to end up around 25 pounds, give or take. My dad and uncle kept track. Last year was 26 pounds and 4 ounces, but two years before, closer to 27 pounds. I swear, these birds had to be part ostrich. The ultimate goal was to get a 30 pounder. It had eluded them all, until one year. Uncle Art had found a new guy. A turkey guy, who promised him the 30 pound bird of his dreams. We knew days before the big day, that the really big bird dream was going to happen. Then my mom got a phone call from Aunt Tillie. My uncle had picked up the beast. He proudly brought it home. He looked at it, lovingly at first. Then he looked again. This was not Uncle Art’s first turkey. He felt something was wrong. Remember, this was something they had all dreamed about finding. Finding it first was cause for bragging rights, for sure. He was convinced that he had been duped, that the bird fell short of its promised weight. He told my aunt about his suspicions and they weighed the bird. It was too big for their kitchen scale, so my uncle weighed himself on the bathroom scale and then weighed himself again, this time holding the turkey. Uncle Art had been right. He was short at least a couple of pounds of the promised 30 pounds. He went back to the turkey guy, irate. The man was defensive at first, but weighed the bird again. It weighed in somewhere in the area of 28 pounds. The man gave him some money back and lacking a bigger bird, Uncle Art brought it back home. 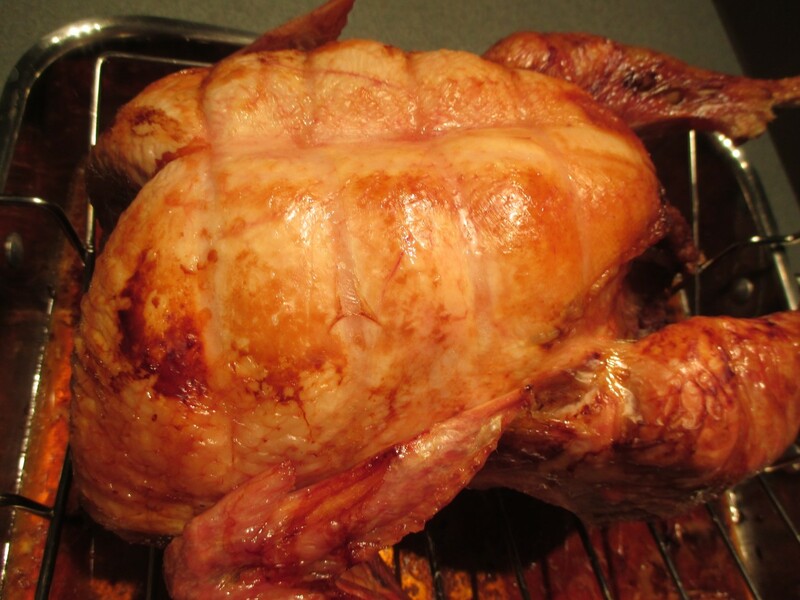 As I recall it was a perfectly lovely bird, cooked to juicy perfection. To my Uncle Art it was both a failure and a success. On one hand, he had not gotten the 30 pound bird he was hoping for. He did, however, take pride in the fact that he spotted it. That in the world of turkeys, he could see the difference between a 28 pound and a 30 pound bird. I believe, some years later, a 30 pound bird was found. The story that year, around the Thanksgiving dinner table, was not so much about the 30 pound bird before us, but about the one that nearly was. I hope you all have a great day, spent with those you love. I also hope you make memories to make you smile, when some of those we love are no longer here. Love and best wishes to all.